Chelsea Grand Cafe had first class written all over it so I understood right away why everyone was excited to have dinner here. Me and the other bloggers I brought along were treated to comfort food like no other. We started the night off with Creamy Clam Chowder in a Bread Bowl (P250). I loved how creamy this soup is. The only problem is I was so hungry that I ate the entire thing and that is not a good sign since there was more food to come. My advice is to not eat the entire bread bowl even if it does look tempting. The best part about the Warm Double Smoked Bacon & Quinoa (P420) is the dressing which is the warm cherry balsamic. Believe it or not, this was the dish I liked the most and that rarely happens for a salad. Who does not like to eat shrimp? Their Prawn Gambas (P495) is spicy so it is not for people with low tolerance on spicy food like me. However, I took the risk of eating it and it was worth it. I enjoyed their shrimps a lot. Anybody who reads my blog knows that I am a carnivore. If there is no meat for lunch or dinner then I won't get satisfied. 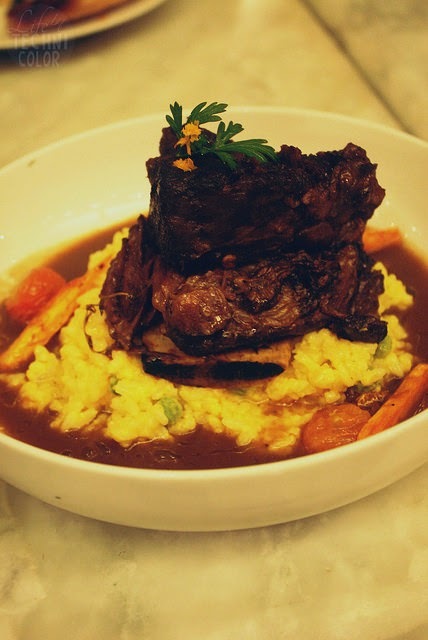 When the Cabemet Braised U.S. Short Ribs (P695) arrived, I was more than delighted. The meat was so tender and I loved that it was served on Saffron and Pea risotto. 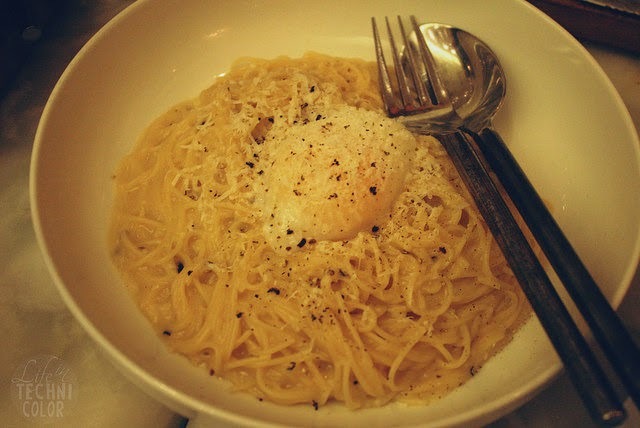 The Cacio e Pepe e Uova (P320) is my type of pasta. It has 2 types of cheeses and 1 hour egg. This is the first time I have heard of a type of egg that was cooked that long. This dish is certainly unique in so many levels and it does not disappoint in any way. 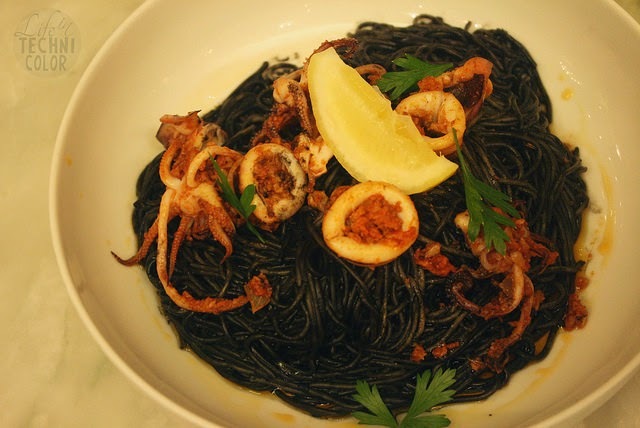 You are surely going to get your teeth all blacked when you try the Spicy Garlic Squid Ink and Chorizo (P350). It is one pasta dish that is going to tickle your taste buds in place you would have never imagined. I think the Saffron "Moules Frites" (P495) stole the show as I got to eat some Chilean Black Mussels for the first time. It came with Pommes Frites so it was an unexpected combination to say the least. However, that does not mean that they don't fit each other because the fries will calm you down after having some of that spicy mussels. The taste of the Spicy Garlic Seafood & Spinach pizza (P475) would stay on you for quite some time because of the nice combination of spinach and seafood. Chelsea is well known for their stone fired pizza pies and the flavors were magnificent. The dough is made fresh daily so you know you are going to get something fresh. Vegans would love the Squash Flower, Garlic Greens & Ricotta (P395). It is really healthy and guilt-free. In fact, I loved it a lot myself despite the fact that I am a carnivore. Most of us did not have any appetite left for dessert and that ended up a big mistake. The Oven Baked Warm Brownie Smores (P275) is a real attention grabber. You will surely forget about what is left from your diet when you feast your eyes on this beauty. The Chelsea "Peach Melba" (P250) is a combination of a bunch of dessert favorites including almonds, cookie crumble, mantecado and strawberry sauce plus cherry on top. It will surely satisfy your cravings for sweets. The Char-Grilled Norweigan Salmon (P595) came in last and we found out it was for two people as one blogger was not able to finish it all by herself. I thought the inclusion of mashed potato and vegetables here is a wise move as it balances the expected sour taste of the salmon even though it was not that sour as I expected. Watch out for the opening of their new branch Chelsea Kitchen at SM Mega Fashion Hall! The Cacio e Pepe e Uova is also my type of pasta. It's quite unique and different. The color itself looked appealing and the flavor was rich and awesome. The only drawback though was that I kept on worrying about the black squid around my mouth.